I'm new to the S2, 8.0 version. My tablet is up to date on patches. Since coming out of the box (a day short of a week), the Samsung+ app is using the most amount of battery on the tablet. Out of the last 2d 12h on battery Samsung+ has used 20% of the battery. This crazy high use has been the norm for my tablet. The next highest is 15% for screen. After that it falls off a cliff at 4% for Android System. Even sitting in standby, I lose battery and it seems to be this Samsung+ application. I have not seen this complained about on any forums. 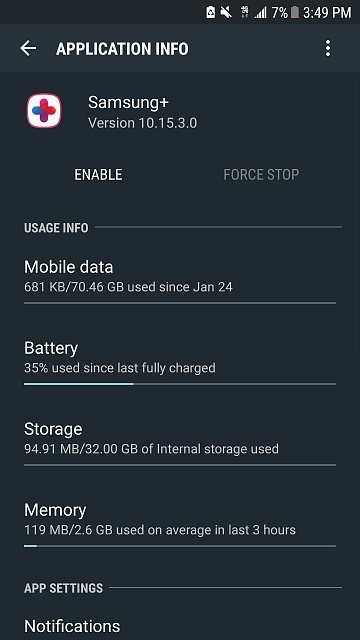 Any idea what Samsung+ is doing and what I may be able to do to control its battery usage? Yes, this app is known for excessive battery consumption on all devices (I've seen it needlessly wasting battery power on smartphones too). Just disable it and don't ever re-enable it, it's pretty useless anyway. Ios doesnt drain battery when on standby at all! I left my ipad 4 on and its still at 100% even after 2 weeks of idling. What sort of magic is that? Post a screen shot of that wizardry. My wife has an iPad and hers drains at idle. It doesn't drain significantly but 2 weeks and not even a percentage lost seems like an exaggeration. I'm developer at Samsung+ app and working on the issue that you reported. We tried on different devices with and without (disable/uninstall) S+ app. There's not much difference so we don't think this is caused by S+. - does your S2 have sim card? If yes, is it connected to an active mobile network? - it would be great if you could get and send us the battery stats of your S2 so we can know what exactly is causing your battery issue. I have the same issue with my Tab S2 8.0. I love the device, but Samsung+ shows 53% battery usage. How can I get a battery report for your review? I know how to do this on Windows, but not on Android. Having the same issue. 35% battery usage left me at 6% around 4pm. Attached is screenshot. I just ended up reporting to samsung and disabling the app. Hope it helps! By DroidH in forum New to the Forums? Introduce Yourself Here! Does the Samsung Gear 2 Neo work with a Samsung Galaxy Note 4? What kind of bug does the bug report detect and can it be put there by an officer of the law? Why are my camera and audio related apps not working?